Been hearing a lot of the punk garage type stuff coming down from the waaaay north thanks to Mammoth Cave Records and now Hosehead. Great to hear that scene documented just like Hozac and In the Red. Hosehead's up there pressing LP's, spray painting sleeves, dubbing cassettes and putting out Ketamines singles. 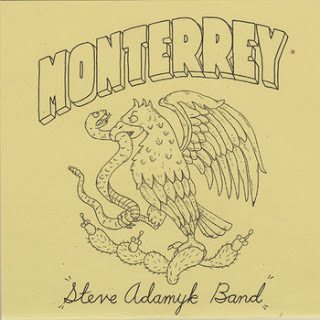 They've also got a new single from this four piece from Ottawa, Ontario, The Steve Adamyk Band, which does in fact include Steve Adamyk on guitars and vocals, but then according to these liner notes everybody's on vocals. A-Side "Monterrey" opens with thick guttural guitars and slappy no depth drums, a weird serious punk sound. They have a thunderous epic pop sound behind this agressive force. Bendy chords wind up that guitar and drop into beefy chords of thin gritty textures like that bone in the taco meat. The chorus is the title of this one and spazzily jabs at a chord structure. It's a fast sledgehammer Hot Snakes sound, which forever are the yeardstick. "You're Fired" cranks up this tempo with the bass line following it's own strange path. It's a party punk rock full of epic bead bashing highs and higher register vocals over the top of this power pop. A celibration of losing that job; "hell yes! ", you have to just be ok with that -or maybe you were looking for it. Fast and skilled this has a lot of effort behind the scenes pulling off this theatrical punk bigger than the sum of its parts. B-Side's "For You (Hold On)" bursts into driving chords but seriously how many times can you say this is big but they keep everything on an even playing ground whie staying melodic, they don't push this into an overblown out place. They seem to have a million of these catchy riff choruses int their collective pockets, making them a real important thing to see live. "Front to Back" is why this thing can be a 45 rpm EP, it's a thousand fast punk bursts but the vocals are taking this into a pop place. They have to be catchy, it's a requirement - if they don't stick in your head then they're tabled for something better. They demand you sit up and pay attnetion but also sing along. They're the kind of thing you'd catch randomly and love more than the headliner. It's fired out of a cannon never losing steam, continuing to pick up speed and miss everything in it's path, like it wasn't even there. There might even be keys or organ in this one. They really build up this plateau, it's a straight wall up - all of a sudden you look down and the ground is gone.